Figure 1. Symmetrical moist red papule with a collarette of scale on the thigh. Figure 2. Excision biopsy demonstrating an irregularly acanthotic epidermis composed of pale keratinocytes, contrasting with the darker normal keratinocytes at the lateral edges of the microscopic field. The collarette of scale can be seen at the edges. 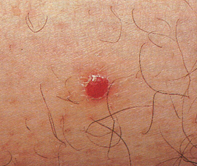 A 54-year-old man presented with an asymptomatic, moist red papule with a collarette of scale on the lateral aspect of his right thigh (Figure 1). The lesion was 4 mm in diameter and had remained the same size over a 12-month period. The diagnosis of this man's lesion ultimately depended on the biopsy findings. The following diagnoses were considered clinically. Histiocytoma (dermatofibroma) may present as an erythematous papule, but the lesion is usually indurated and lacks a collarette of scale. Skin biopsy shows sheets of histiocytes and fibroblasts in the dermis. Spitz naevus is a type of mole seen more frequently in children. The lesion may have a red shiny appearance but lacks a collarette of scale. A spitz naevus may have a history of recent growth, and skin biopsy shows spindle and epithelioid nests of melanocytes. Xanthogranuloma is a form of histiocytoma which may initially present as a red papule, but in time develops a yellow hue due to the presence of lipid and xanthoma cells. Pyogenic granuloma is a form of capillary haemangioma and usually has a friable, vascular surface. These lesions are prone to bleeding, due to the presence of superficial clusters of capillaries. Clear cell acanthoma is the correct diagnosis based on the histopathology and clinical features. Excision biopsy showed an irregularly hyperplastic epidermis consisting of uniform pale keratinocytes (Figure 2). The underlying dermis showed dilated vessels and a mild inflammatory reaction. There was no evidence of atypia. Clear cell acanthomas are usually solitary, measure less than 1 cm in diameter and are localised to the lower limbs of middle aged individuals. The pale keratinocytes are filled with glycogen. The cause of this unusual papular lesion remains unknown. Solitary lesions can usually be removed by simple excision. Rarely, multiple lesions may develop and these have been successfully treated with cryotherapy. A persistent red papule with a collarette of scale is a clinical clue to an unusual benign lesion called a clear cell acanthoma. This article was first published in Modern Medicine of Australia in November 1997. It was reviewed and updated in July 2011.